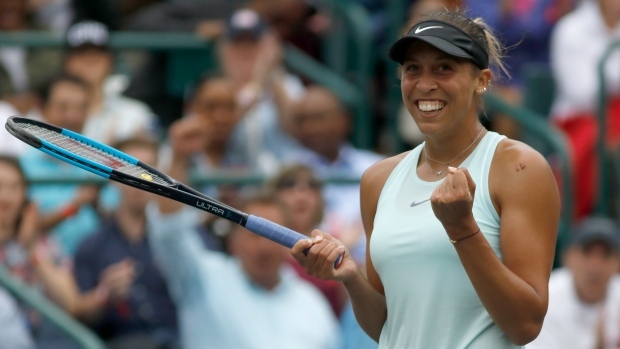 CHARLESTON, S.C. — Madison Keys got much more than she expected at the Volvo Car Open, leaving with her first championship in two years and a successful reunion with coach Juan Todero. Keys was unsure how she would handle the season's first clay-court event — clay is not among her favourite surfaces — or if she'd mesh again with Todero, who had worked with her in 2013 and 2014 and was back in her corner this week after five years apart. Wozniacki said she believed Keys' shot was drifting long. "Sometimes you miscalculate in a bad moment," the former world No. 1 said. The second set was more of a runaway for Keys, who won four of the final five games. She won four consecutive points to break Wozniacki's serve, then won four more points to lead 5-2. Keys was "just too good for me," said Wozniacki, who had beaten Keys in their only two previous meetings. Keys beamed and bent her knees and elbows in celebration after putting away Wozniacki's return at the net on match point. Her first win of the season continued a curious trend on the WTA of 15 different winners for the tour's first 15 tournaments this season. "Clay-court specialist," Keys joked. "It's definitely moving up on my ranking list of favourite surfaces."